Veterinary Faculty, University of Ljubljana, 2017. Ethology of Dolphins, activities of Vivamar Society and ecology of Dolphins off Istria and Slovenia, presented by Darja Ribarič. Public Library of Kamnik. Hormonal imbalance: why do we gain weight by having the same diet? In the light of that healthy persons contribute to the healthy & sustainable environment, which can be projected as well to a marine environment. Presented by Darja Ribarič. Radio Koper, RTV Slovenia, 2017. An intervew with Darja Ribarič “Dolphins communicate with using their names“. University of Ljubljana, 2017. Cognitive Science, Interdisciplinary studying programme; project ‘Thank you for the neurones‘, 2017. “Animal Cognition“, invited guests (Kralj Fišer S., Ribarič D. and Muršič Z.) are talking about animal cognition, including dolphins as the main topic of Vivamar Society research in the NE Adriatic. Radio Trieste, RAI, 2017. An intervew with Darja Ribarič about Bottlenose dolphins in the Slovenian Sea and off W coast of Istria. Alijeski Aleš. Maj 2007. “Kako se igrajo delfini.” Gea (navedba spletne strani društva Vivamar). Ribarič D., 2004. 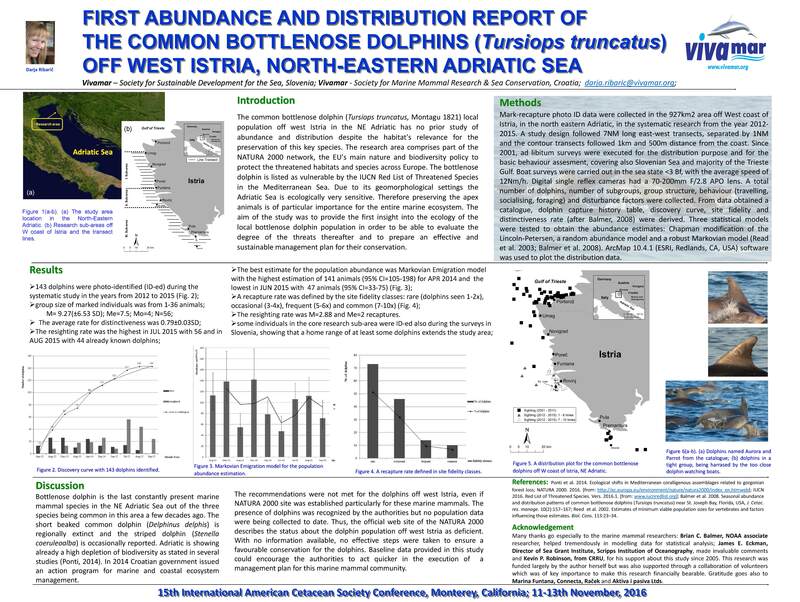 “Dolphins as bioindicators of the ecological sea state”. International Conference of East-West dialogue about the seas. Stranka Mladih Slovenije . Izola, Slovenija, April 2004.